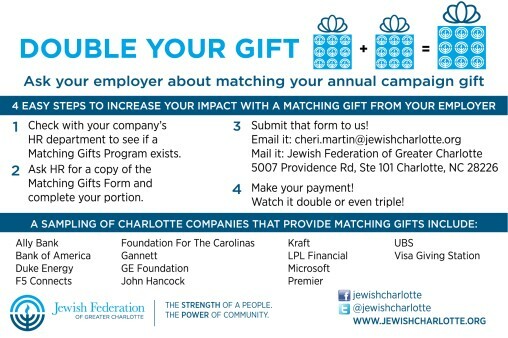 Did you know that many companies have gift-matching programs that will match your donation to Jewish Federation of Greater Charlotte dollar for dollar? Gifts may include monthly payroll deductions as well as annual gifts. Gift-matching programs are a great way to maximize your personal contribution to Federation. Don't leave money on the table! Take advantage of your company's matching gift benefit to help increase YOUR impact for the community! For employees: You will be acknowledged at the recognition level that includes your employer’s match. For example, if you make a donation of $500 to Federation and your employer’s matching gift brings the total contribution to $1,000, you will be recognized at the $1,000 level. This would give you eligibility to attend an event that requests a minimum suggested gift of $1,000. Here is a sampling of Charlotte companies that are Match-Makers and have historically offered employees a matching gift donation. Don't worry - if your company is not on this list, just check with your HR department. Questions? Contact our Accounting Department, 704-944-6757.